We give a description of a Petri net-based framework for modelling and analysing biochemical pathways, which unifies the qualitative, stochastic and continuous paradigms. Each perspective adds its contribution to the understanding of the system, thus the three approaches do not compete, but complement each other. We illustrate our approach by applying it to an extended model of the three stage cascade, which forms the core of the ERK signal transduction pathway. Consequently our focus is on transient behaviour analysis. We demonstrate how qualitative descriptions are abstractions over stochastic or continuous descriptions, and show that the stochastic and continuous models approximate each other. 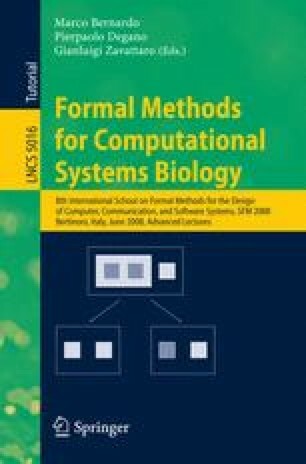 Although our framework is based on Petri nets, it can be applied more widely to other formalisms which are used to model and analyse biochemical networks.